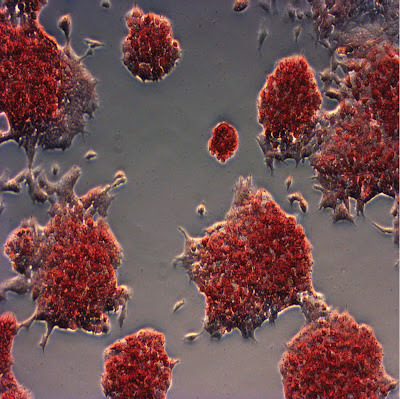 Induced pluripotent stem cells generated using a kinase inhibitor. To understand stem cells, there are two terms that are important to understand; pluripotency and differentiation. Differentiation is the process in which the cell can transform itself into a higher class or specialized type of cell. Pluripotency in stem cell biology means that the cell can differentiate itself into three types of germ layers: the endoderm, the mesoderm, and the ectoderm. The term "germ layer" more or less refers to the tissue layer. A group of germ layers eventually form tissues and organs of the body. These three germ layers a stem cell can differentiate into, form much of the human body's organs. The endoderm forms into the internal organs such as the lungs, stomach lining, and the intestinal tract. The Mesoderm forms muscle and bone groups while the ectoderm forms epidermal tissues and the nervous system. Because the stem cell can differentiate into other type of cells, there is much focus on this field for medical research. Stem cell research can open up new and effective treatments for otherwise difficult conditions such as alzheimers, parkinsons, cardiovascular diseases, and even cancer. Early in stem cell research, a primary source for these type of cells were embryonic stem cells. These cells came from human fertilized eggs that are about four to five days old. Because of the manner of this process, there are moral issues that were raised with regards to these type of cells. A recent technology introduced another way to source stem cells. These are called induced pluripotent stem cells or iPSC. These are artificially produced stem cells from non-pluripotent cells. The process is done by inducing or activating dormant genes within the cell to activate its pluripotency. The process researchers use to generate induced pluripotent stem cells (iPSCs)—a special type of stem cell that can be made in the lab from any type of adult cell—is time consuming and inefficient. To speed things up, researchers at Sanford-Burnham Medical Research Institute (Sanford-Burnham) turned to kinase inhibitors. These chemical compounds block the activity of kinases, enzymes responsible for many aspects of cellular communication, survival, and growth. As they outline in a paper published September 25 in Nature Communications, the team found several kinase inhibitors that, when added to starter cells, help generate many more iPSCs than the standard method. This new capability will likely speed up research in many fields, better enabling scientists around the world to study human disease and develop new treatments. "Generating iPSCs depends on the regulation of communication networks within cells," explained Tariq Rana, Ph.D., program director in Sanford-Burnham's Sanford Children's Health Research Center and senior author of the study. "So, when you start manipulating which genes are turned on or off in cells to create pluripotent stem cells, you are probably activating a large number of kinases. Since many of these active kinases are likely inhibiting the conversion to iPSCs, it made sense to us that adding inhibitors might lower the barrier." According to Tony Hunter, Ph.D., professor in the Molecular and Cell Biology Laboratory at the Salk Institute for Biological Studies and director of the Salk Institute Cancer Center, "The identification of small molecules that improve the efficiency of generating iPSCs is an important step forward in being able to use these cells therapeutically. Tariq Rana's exciting new work has uncovered a class of protein kinase inhibitors that override the normal barriers to efficient iPSC formation, and these inhibitors should prove useful in generating iPSCs from new sources for experimental and ultimately therapeutic purposes." Hunter, a kinase expert, was not involved in this study. At the moment, the only treatment option available to many heart failure patients is a heart transplant. Looking for a better alternative, many researchers are coaxing stem cells into new heart muscle. In Alzheimer's disease, researchers are also interested in stem cells, using them to reproduce a person's own malfunctioning brain cells in a dish, where they can be used to test therapeutic drugs. But where do these stem cells come from? Since the advent of iPSC technology, the answer in many cases is the lab. Like their embryonic cousins, iPSCs can be used to generate just about any cell type—heart, brain, or muscle, to name a few—that can be used to test new therapies or potentially to replace diseased or damaged tissue. It sounds simple enough: you start with any type of differentiated cell, such as skin cells, add four molecules that reprogram the cells' genomes, and then try to catch those that successfully revert to unspecialized iPSCs. But the process takes a long time and isn't very efficient—you can start with thousands of skin cells and end up with just a few iPSCs. Zhonghan Li, a graduate student in Rana's laboratory, took on the task of finding kinase inhibitors that might speed up the iPSC-generating process. Scientists in the Conrad Prebys Center for Chemical Genomics, Sanford-Burnham's drug discovery facility, provided Li with a collection of more than 240 chemical compounds that inhibit kinases. Li painstakingly added them one-by-one to his cells and waited to see what happened. Several kinase inhibitors produced many more iPSCs than the untreated cells—in some cases too many iPSCs for the tiny dish housing them. The most potent inhibitors targeted three kinases in particular: AurkA, P38, and IP3K. Working with the staff in Sanford-Burnham's genomics, bioinformatics, animal modeling, and histology core facilities—valuable resources and expertise available to all Sanford-Burnham scientists and the scientific community at large—Rana and Li further confirmed the specificity of their findings and even nailed down the mechanism behind one inhibitor's beneficial actions. "We found that manipulating the activity of these kinases can substantially increase cellular reprogramming efficiency," Rana said. "But what's more, we've also provided new insights into the molecular mechanism of reprogramming and revealed new functions for these kinases. We hope these findings will encourage further efforts to screen for small molecules that might prove useful in iPSC-based therapies."